Most local business owners are familiar with the importance of location. The commonly used saying that retail is all about “location, location, location” isn’t just in the physical world. The right location within a city, on a street or even within a mall can have a tremendous impact on how well your local business is at drawing in customers. But location is also what drives digital marketing, mobile marketing as well as digital and local foot traffic for your small business within the digital space. Though location marketing online is very different from selecting a physical location for your brick and mortar store address, it is nonetheless what can help or hurt your retail business marketing if you don’t utilize it properly online. Local marketing online involves multiple components that must work together properly to achieve the desired effect. Your local website, proper address, mobile considerations and separate local web listings combine your local digital marketing and location footprint. This local business footprint is what mobile devices, users and search engines use to identify, verify and rank your small business. In a recent study released by the Pew Research Center, it was revealed that 90% of smartphone users have utilized location services on their phone. These mobile location services are integrated into various smartphone apps in order to help provide locality based information, directions and more, based on where the user is at that moment. In just the last two years the number of smartphone users that are activating and using location-based services has increased by 26%. What’s more is that the number of smartphone users as well as the percentage of them that are projected to use location-based services on their phones are expected to increase by around 8% each, bringing the current location-based users to nearly 98%. In fact, mobile location services are now more prevalent with smartphone users than the share who use popular music or video services on their mobile devices. This just can’t be ignored by local small business. If research proves that 90% of smartphone users say they use their mobile phone to get directions, recommendations or other information related to their current location, then small business needs to pay very close attention to their local marketing efforts online. In order to capture smartphone users who utilize location-based services requires several components. Local Website – Many small businesses think they have a local website that works for their business. It is true that having the proper location, business name and information on your local website and formatted in specific ways that search engines and other platforms want them is important. However when it comes to taking advantage of location services on mobile devices as a small business, it is more involved than you might think. As more and more consumers access websites and content via their smartphone, small business must invest in making sure their site is responsive when mobile visitors arrive. A mobile website, is a local website that contains the same information and graphics your main website does, however it displays the site differently when accessed from the various types of mobile devices consumers use. So regardless of whether your potential local customer accesses your website via an iPhone, iPad, Android or other mobile device, the website transforms its margins, layout and display to be optimized for that specific user at that specific time. Websites that are mobile responsive are proven to achieve longer visits, bounce fewer visitors and be much more receptive by mobile users because they are much easier to read on a handheld phone. Address and Information – Did you know that formatting your company name or local address differently from your website to other listing services can negatively affect your rank with search and other location services? There is no doubt about it, it can and often does. Local and location-based marketing is all about the details and literally dotting the i’s and crossing the t’s. Being consistent with how you depict your business name and address makes a difference. EXAMPLE: If your website has your local address on several pages and each has just slightly different formatting, you will pay a price. For example, if your local store location address is 102 West Main Street, but sometimes you write it as 102 W Main Street, 102 W. Main St -or- 102 West Main St., you are creating havoc for your local marketing via location services. Web Listings – There are around 15 location listing services that are used together to compare the accuracy of your business location across the web. These listings are combined via search engines and other apps to evaluate your location in extreme detail. When some of these listing services contain different, inaccurate or incorrect location information on your local business, it will harm your location services effectiveness. Some of these listing services are Google plus, your Facebook page, Foursquare, Superpages, Infogroup, Localeze, Factual, Yelp and Citisearch, to name a few. Ensuring that your business location information is always accurate and exactly the same across the web is crucial. Search – Among many other things, search engines such as Google and Bing, use content to rank search listings as well as business location search results. Search engines also deploy location services on mobile to help users locate relevant sites and content based on where they are. Having content on your main website, as well as consistently creating new, fresh and location relevant content that interests your audience will enable you to drive additional traffic and be discovered by your local audience. Blog articles are crucial for this function and requires that the content you create to be extremely relevant, of high quality that conforms to formatting and structure that the search engines favor, as well as information about the area or city your business is in. You should be producing at least one new blog article per week that addresses these important content marketing components. There is no doubt that mobile devices, location services and local business marketing have transformed how small business works today. 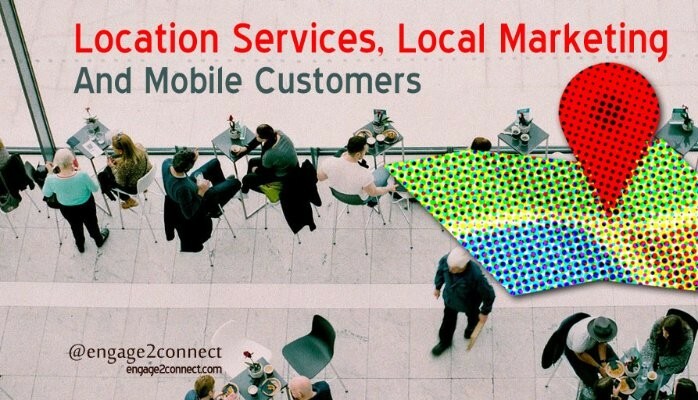 Ensuring that you local business is positioned properly to capture 90% of the population using location services on their mobile device is now a required local business marketing function. We can assure you that some, if not all of your competitors are either already doing it or plan to soon. You need to beat your local competition to the local marketing and location services punch from mobile if you want to grow.